Living to the tradition of heading out for Team Eat out after payday, the team decided to have some Yakiniku. Who can ever say no to Japanese buffet anyway? Yakiniku meaning grilled food dishes either meat and vegetables over a flame of charcoals. This cuisine is essentially the Japanese interpretation of Korean BBQ or as you may know samgyupsal. The Yaki House offers a booth which is seen above and is installed with a personal grill installed at every table, everyone instantly becomes an expert cook. 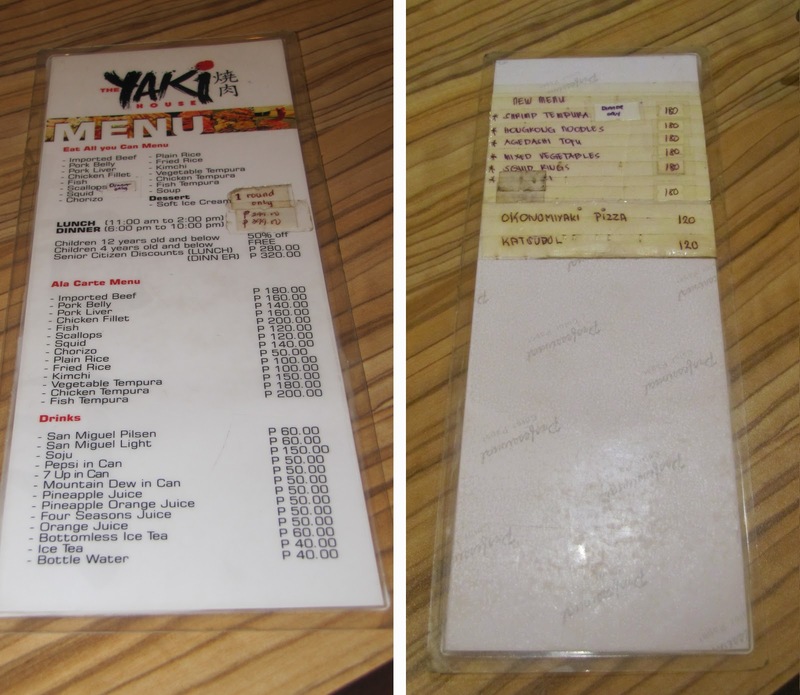 The Yaki House staff are friendly and more than willing to help you through out the experience. They will be more than happy to replace charcoal if you think that it's no longer hot enough to cook. Adorn with these cute Japanese dolls and keeping its minimalism decor, the place is quite cozy and is a perfect choice for families and catching up with friends. In between meals is the perfect time for photo opportunities. Here's what we had cooking on the grill, a mix of every meat. Seafood, pork and beef. Breaded Dory has a well mix of crunch from the breading and the softness of the fish. The calamari was good, cooked just right and the dish can serve 2 to 3 guests. The Fried Rice was a favorite and I loved the fact that they also serve kimchi. They also refill it as needed. Check out their menu. We opted for Dinner ata Php399 per person while Lunch is Php299. Lunch is from 11AM to 2PM daily and Dinner is from 6PM to 10PM. The staff will ask you what meat to be served and we selected the following: Imported Beef, Pork Belly, Chiken, Squid, Chorizo. The imported beef was the bomb! It was so good that we asked for 12 more plates. Yes, we had 12 plates of meat! Certainly, a sure hit for the team and for the budget as well. Come in hungry and leave with bursting tummies. I enjoyed the experience and had a great time with the team. Sometimes, a meal is better if you have great company. Friends have not recommended Yaki House. You're the first person I "know" with a positive review of this place. The soup that's included in the eat-all-you-can menu, is it miso soup? Really? How come? It's Quail's Egg or was it Birds Nest?